Harriet Vidyasagar (left) and Bindi Dharia (right) with the new principal of the school Loretta Colaco. On Saturday July 7th, 2012, we conducted a Teachers’ Update Training session at Our Lady of Merces High School, Merces, Goa for the primary school teachers who have been involved with the OLPC project at the school. 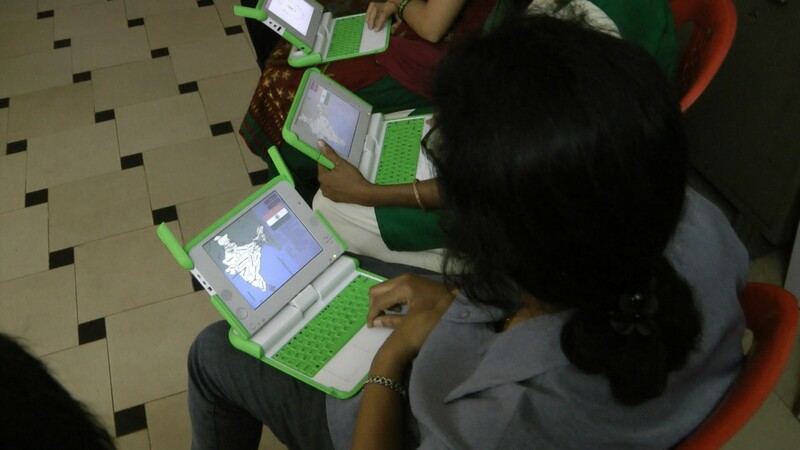 Besides Harriet Vidyasagar who has been with the Merces OLPC project since its inception, Bindi Dharia, an intern with OLPC USA, was also present for the training, which was conducted by Salil and Gayathri. It had been almost one and a half years since the last Teacher Training at Merces, and with so many new Sugar activities having come up since then, it was essential that we have this training before the new academic year began in full swing. We also needed to stress the importance of using Turtle Art in the XO classes. Turtle Art had been part of the previous training, but hadn’t been incorporated into the XO classes last year. After the Geometry Camp that we conducted in April this year, we were convinced that Turtle Art was an invaluable tool to use while teaching basic geometry to the children. It was therefore decided to start the training with a refresher session on Turtle Art, focusing on simple geometric shapes – the square, the rectangle and the rhombus – how to draw a square in Turtle Art, and then tweak the parameters to turn it into a rectangle and then a rhombus. The teachers responded well with hands-on participation on their XOs; some of them who finished early even went on to draw the more difficult triangle. Teachers explore the new activity ‘I Know India’. The latter part of the training was spent in introducing the teachers to some of the new game-like activities that are available within Sugar, starting with the word-based activities ‘Letters’ and ‘Across and Down’. ‘Letters’ requires you to create words from a jumbled set of letters (the longer the word, the more points you get) while ‘Across and Down’ is based on the popular word game Scrabble, and is played similarly. Besides these, we also introduced the teachers to ‘Numbers’, which is an activity that has been around for some time, but hasn’t really been used in the XO Classes in the school. I recalled that during the Digital Stories workshop last year, the children did use this activity quite a lot and enjoyed competing with each other to see who would get to a score of 100 first, so we decided to demonstrate the activity to the teachers, with the idea of getting them to use it in the XO classes this year. We managed to finish the training in time, but also decided that we would try to have another update training after a couple of months to cover a few more activities that I have in mind, which I think will work well in the school. For now, the teachers have enough to work with.